If you choose to come in or call the appraisal district and initiate an inquiry and/or send in your protest by mail, you will not be able to protest online. If you think you should be eligible to file a protest online but cannot, please contact us here . 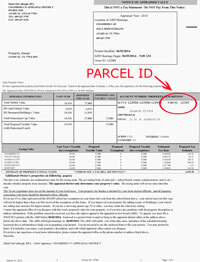 THE ONLINE PROTEST FUNCTION IS AVAILABLE WHEN PROPERTY APPRAISAL NOTICES ARE MAILED. THIS FUNCTION WILL END ON MAY 15TH OR LAST FOR 30 DAYS, WHICHEVER IS APPLICABLE. If you don't have your notice of appraised value, use "New Property Search" below. ©2019 Pritchard & Abbott, Inc. - All rights reserved.